This is coming after the Abia state Governor, Okezie Ikpeazu announced that soldiers will withdraw from the streets of Aba on Friday. 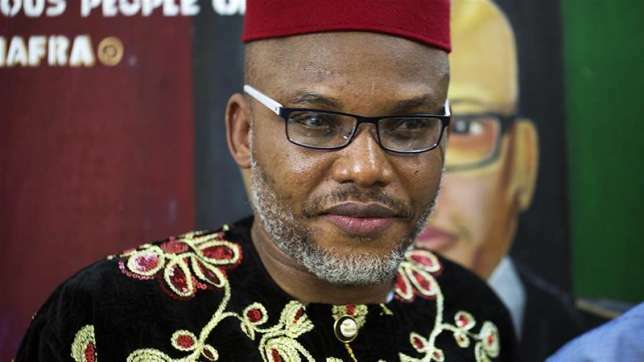 A combined team of the Police, Department of State Services (DSS) and Army have reportedly raided the Abia home of the leader of the Indigenous people of Biafra (IPOB), Nnamdi Kanu. According to Daily Post, the security operatives, who swooped on the house in commando style, allegedly abducted Kanu’s parents. Reports say, the spokesman of IPOB, Emma Powerful also confirmed that their leader’s parents and siblings have not been seen. Powerful said “Yes, they broke our leader’s home in Afaraukwu Ibeku Umuahia, at about 1.30 pm. The combined team of Nigerian Army, police and DSS including civil defence corps, broke Nnamdi Kanu’s house this evening and killed many of our members in the front of our leader’s house. “Right now, we cannot ascertain the whereabouts of our leader, Mazi Nnamdi Kanu and his family members including his father, mother and siblings. “This invasion by the Nigerian Army is being led by Major General Buhari, supervised by Brg. General Buratai and his co army of occupation. “They killed many of our members who have been staying with our leader Mazi Nnamdi Kanu and carried away the dead bodies. “We are calling on men and women of good conscience around the globe to prevail on Nigeria Government and her security operatives, especially the Nigeria Army to return back the dead bodies for our burial. “The number of people killed in our leader’s house will be made available to the press men after the proper account of the dead and the living, who were narrowly escaped from the attack from Nigerian Army and other operatives. This is coming after the Abia state Governor, Okezie Ikpeazu announced that soldiers will withdraw from the streets of Aba and Umuahia from Friday, September 15, 2017.